This post was previously published on Maison Cupcake. Whether it’s on TV or film, every now and again, the glimpse of somewhere I’ve been before pictured on screen fills me with excitement. Daniel Craig walking down the street where I used to work in Layer Cake. An obscure Tim Roth movie filmed in and around Southgate tube station. Borough Market in Bridget Jones’ Diary. About 4 years ago, in the closing titles of 80s detective series Bergerac on UK Gold, I saw a picture of the plane tree lined pool shown below. Not many people remember that the closing series relocated to Provence rather than its usual Jersey. I have holidayed in Provence many times and was intrigued by this pool which was shown at the very end of each episode. How come I’d never seen it in a tourist guide or on my travels? Where on earth was it? I was determined to find it, not because Bergerac, my pregnancy craving at the time (others dip Cheerios in ketchup; I watched endless episodes of Bergerac and did 3 Sudoku puzzles per day but have done neither before or since, honest) had been filmed there but out of my quest to know every corner of Provence. Shortly afterwards I saw my Provencal pool onscreen once more. It was featured in what was to become my favourite film ever, Ridley Scott’s romantic comedy A Good Year starring Russell Crowe and Marion Cottilard. Now this film did not go down well with critics and you’ll probably find more people admitting to liking Bergarac than the film but I know from conversations on Twitter that at least three people, including Juls share my love of it. Even freakier, Max (Russell Crowe) has inherited Jim Bergerac’s new house, this gorgeous bastide – Chateau la Canorgue in the Luberon. That’s just spooky. Happily, locations in the film are much easier to research than a random film still in one series of Bergerac‘s closing titles and I soon deduce that the Provencal pool is in Cucuron, an understated village north of Aix en Provence with no other claim to fame. I conspired to visit during my weekend in St Remy de Provence. 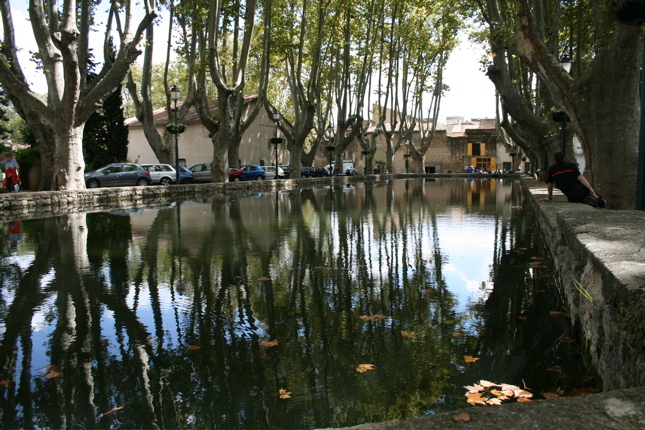 We drove there on the Sunday after visiting the busy brocante at L’Isle sur la Sorgue. We drove to Cucuron and discovered the sleepiest of Provencal villages. Streets were deserted. Saucepans belonging to vielle madames clattered as we passed kitchen windows. Cats barely lifted eyelids to look at us. There was no sign of a square with this huge pool centre stage which had accommodated an orchestra and outdoor cinema showing clips like Charles Trenet singing Boum where Max and Fanny kiss after everyone else has bolted in the rain storm. Eventually, on the point of giving up, we found a map marking L’Etang and tucked away in a corner we found the pool with a couple of cafes and sat down for our less romantic glass of Sprite and an ice cream next to the local fire station (odd… they disguised this in the film). Sadly I can’t find clips to embed due to copyright… You can pick up copies of A Good Year for £3.99 on dvd. If you like France, you will enjoy it.